What are you thankful for this year? Family, friends, food on the table? Imagine having to dive or surf in frigid waters below zero? Having to wear a 7 mil wetsuit every time you wanted to catch dinner? Yup that's not the Koolau mountain range in the background but real snow! You can only imagine how cold this dive was as I got ready to spear some salmon on our last trip to Alaska. We have a lot to be grateful for this year and thank you for allowing us to be a part of your life's journey. Happy Thanksgiving everyone! Ia Ora Na, we just returned from the secluded Tuamotu Islands of Tahiti and experienced the true Polynesian Hospitality. Our guide/interpreter/diver in the middle of the group, Tim Nakamura hooked us up with his close friends of Manihi and our Red Sea Crew captured the moment with over 1000 photos and high definition video to come on Hawaii Skin Diver TV. A big "Maruru" thank you to Gilles, Angela, Nakamura Ohana, and all the people of Manihi for opening our eyes to what "Aloha" really means. 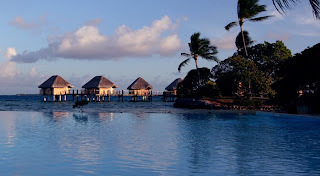 This was one of the resorts on Manihi which offered a beautiful view with bungalows overlooking the lagoon where the Tahitian Pearls are farmed and have become so popular.